Even as this is being written, the new WSJ Society website is being tested. By the time you read this, it will be up and running. Some of you will probably be reading this on the new website. It is without question the most dramatic change in the way the organization functions since its founding in 1989. Members now have an active role. If you haven’t yet registered, please do so. If you have just visited the site or even if you have registered and found it intimidating or difficult in any way, click on the “Help” button or go to the “Suggestions Box” link on the Members menu. We want to make the site as accommodating as possible to our members. Several changes have taken place in our WSJ Society leadership. Brian Bould is our new Treasurer. Brian has served on the board since 2009. He replaces Bonnie Lenz who has been on the board since 2004 and has served as Treasurer since then. We thank Bonnie for her years of faithful service. She will continue as a member of the board. Greg Pascucci is our new Membership VP. Greg joined the board in 2012. He replaces John Enright who has been on the board since 2004 and has served as Membership VP since then. We also thank John for his years of faithful service. Jude Anders has accepted the position of Communications VP. This position has been vacant since 2004. It now has new significance with the launching of WSJSociety.com. You will find Jude communicating with you and fostering communication among members as you navigate the website. Jude will continue as acting Program VP until another volunteer is found to fill the position. New board members are needed! In addition to filling the Program VP position, it is important to keep continuity on the board as others of us have served for many years and will want to be replaced. Participating on the board is gratifying. Consider it. Then contact a current board member. 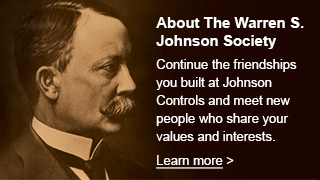 With your help the WSJ Society will continue to flourish. We were saddened with the passing of Sharlene on July 19. Sharlene served on the board since 2002 and was Program VP from then until 2012. Her service on the board, as it was with her years of service to the company, was always performed with excellence and in the interest of “customer satisfaction”. If you haven’t already done so, please read the article about Sharlene’s 100 year old mother in the last newsletter. Thanks to Barb Helgesen for writing the article and providing the picture of Sharlene and her mother and sisters.